So, you signed up to make cakes, right? You didn't realise that this also meant you needed to be an accountant, web designer, artist, photographer, economist and graphic artist? I am not kiddin'! Having basic graphic design skills when you run a cake business will help you heaps and heaps. It will open the door to everything from classy business cards, to top notch social media posts that will help you build and grow your page. Then you have a mini crisis of self confidence and convince yourself that "someone your age" probably cannot even learn all this stuff because your mind just doesn't get it. I have been there, done that, and worn the T shirt. For my entire cake life, I have used an amazing graphic designer and artist to help me on stuff. He is brilliant - totally awesome and I will always use him. BUT, as my business and my skills progressed, I wanted to have the freedom to do things RIGHT NOW...as opposed to planning them and relying on my graphic designer to produce something. And that is when I started looking into the best graphic design tools that make life easier for cake business owners. I stumbled across Be Funky a year or so ago when I had some problems with Pic Monkey and boy, am I glad I did. Be Funky is free to use for many of the features so you can perform some good editing on the free plan. When you join you will see all features available but those that are paid for features will be marked so you don't waste time trying to use them and then do all the work and get tricked into paying to save the work. As you can see above, the things that you need to upgrade to are highlighted with an orange star. I like this because it is too common these days for companies to let you use something for free and then once you have spent hours working on it, you discover the only way you can download or save it, is to purchase a paid plan. With Be Funky, they have a good clear process on how things work from the beginning. You can opt to get the paid plan and this is suprisingly inexpensive at just $2.91 monthly if you pay yearly ($34.92 a year) or $4.95 a month if you pay monthly - as always it is way cheaper to pay yearly for any kind of subscription or membership. As this is one of my favourite tools to use and as I use it nearly every day, inside the Pretty Witty Academy, I have a full length, detailed video tutorial giving a step by step guide on how you can use Be Funky within your cake business. This is really helpful for anyone wanting to grow their social media presence or make their social media posts look more professional. Definitely! Try the free plan to see how you get on but it is one of those tools that I just think is worth the payment each year because of what you get. It is not expensive and you could always try it for a year and then cancel if you don't use it as much as you like. What I found was that I actually saved a lot of costs for things I could then do myself rather than referring to a graphic designer. Some of the really simple things that you will then be able to do for yourself are a great starting point. But you can actually take Be Funky quite far once you are used to it and really get some amazing effects. Much of the imagery on the Pretty Witty Cakes and the Pretty Witty Academy website has been done in Be Funky. Can you save the images? Yes you can. Be Funky gives you the option to Save to your files in Be Funky or to save directly to your computer. In addition, you can save to Googledrive, Facebook, Pinterest, Dropbox and Twitter. There is also a mobile version for those who work on mobile. To be honest, for the price, not really. I sometimes find that the saving process has one round of clicks too many (it sometimes feels like you are being asked to click twice to save things) but other than that it is a great tool. To show you what I mean, I took this image below and then played in Be Funky for 2 minutes. Watch this short video to see what I mean on how quickly you can play with things in Be Funky. There is no narrative by me in this video as there is a full narrated step by step tutorial in the Pretty Witty Academy. To check out Be Funky for yourself, you can sign up with them here (and don't forget if you are a Pretty Witty Academy Business Member there is a full and detailled training tutorial showing you how to get the best out of Big Funky). Canva is another free graphic design tool that can be used for a whole host of things. It differs from Be Funky in many ways in that there is quite a lot of pre-made graphic work that you can use and then simply change the font. For example, in Canva, they will supply images such as infographics, postcards, invitations, posters etc that are pre-made and you can simply change the words and/or images. With the above, image you can then just edit the colours, the text and so on to make it suit what you need. There are a huge number of templates like this in Canva so it is a great tool for cake makers. For example, if you had a shop or a cafe, they have recipe cards and you could make beautiful recipes and sell them or hand them to customers. If you ran cake classes, you could make beautiful class handouts with real ease using Canva. If you make wedding cakes, you can make a laminated handover card or printed graphic of the cake with all the details or diagrams about which part of the cake to eat, where the armature or internal support is and so on. 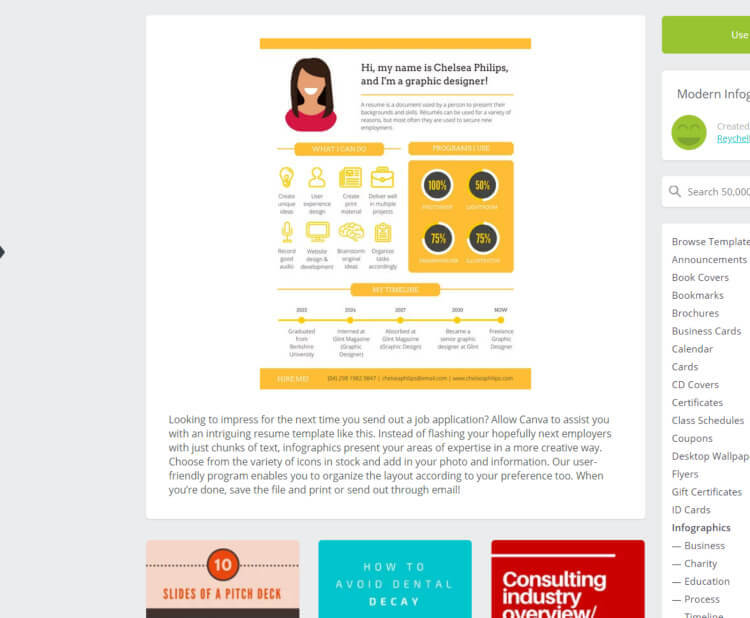 Canva works on a drag and drop basis. This means it is a little tricky to get used to if you normally work with something like Be Funky or Pic Monkey. When you drag and drop, often it is into the dimentions given and although you can resize, it is not always as intuitive as it good be. I would describe it as one step harder to use compared to something like Be Funky. On the flip side, it can give you some very professionally looking designs - very similar to what an experienced graphic designer would produce. 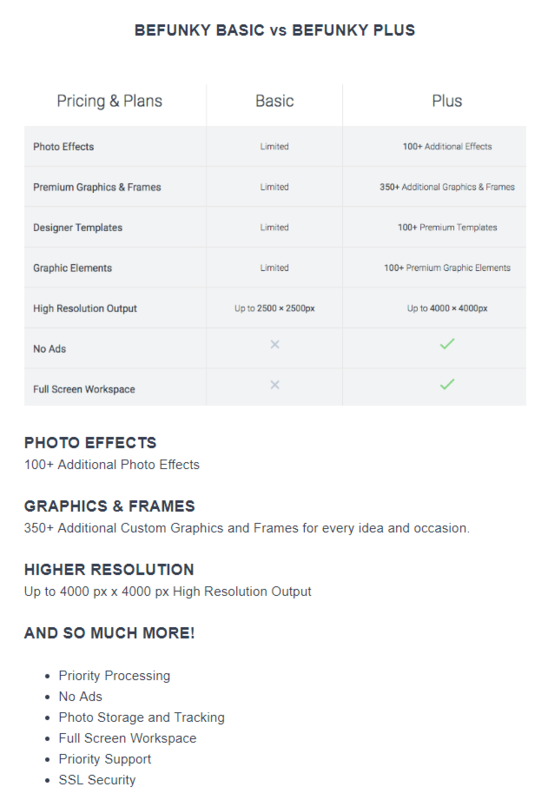 Canva is free to use but as with all free products, there is an upgrade option which unlocks bigger and better graphics, templates and tools. The paid for plan is $12.95 a month which is significantly more expensive than be Funky. As always it is cheaper to pay yearly working out at $119.40 a year (ie $9.95 a month). Can you save and download image? Yes you can. The saving folder system within Canva is a bit clumsy to use in that everything is laid out in full. Whilst this makes sense so you can visually see things, it starts to get tricky to manage when you have 100s of things in there. There are sub-folder systems to organise your work and it is good practice to use these from the beginning - trust me on that one as I didn't and ended up spending hours re-organising 100s of Canva designs I had made further down the line. You can download easily and one of the nice things is that you can download pdfs, pngs and jpegs depending on your needs. You can also add your own photos to designs and so on. 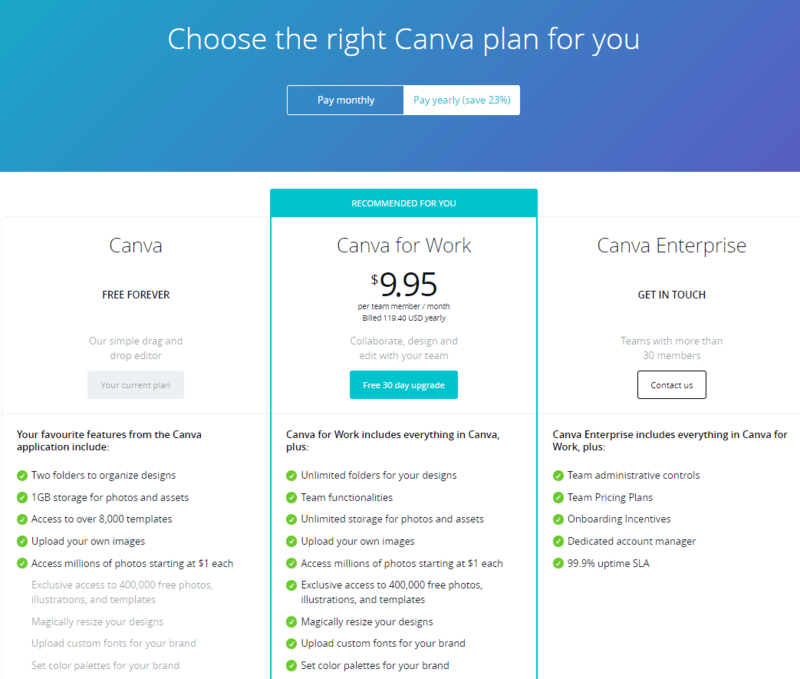 To start with, I would take the free plan on Canva whilst you get used to it. The paid plan usually gives you a month free as well so if you really cannot get on with it then you can cancel. 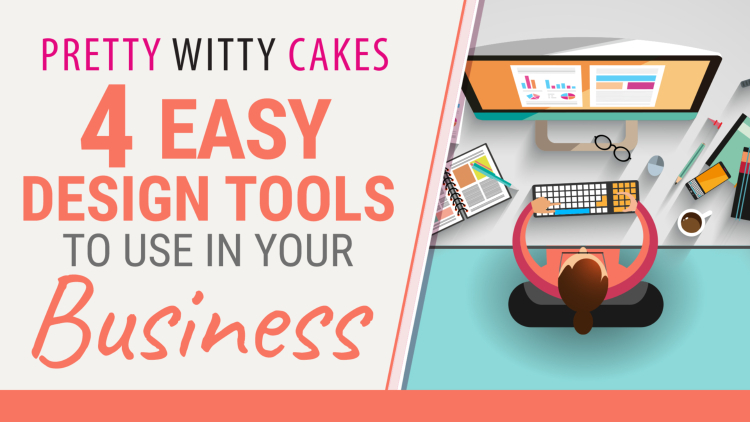 For detailled tutorials on how you use Be Funky and Canva and other graphic design tools in your cake making business, join the Business Membership Pretty Witty Academy. Years and years ago there was a wonderful tool that I used for all my graphic design work but it closed down. And in its place came Pic Monkey (I have a feeling that staff from the app I used before may have set up Pic Monkey but I may be wrong there). Pic Monkey was my go to tool for about 5 years with graphic design work at Pretty Witty Cakes. However, in 2017, I had an issue with my billing with them and it led to me deciding to leave. That was a shame as I liked them a lot. Pic Monkey is an excellent tool. It is very similar to Be Funky and has a lot of features that are similar in both products. 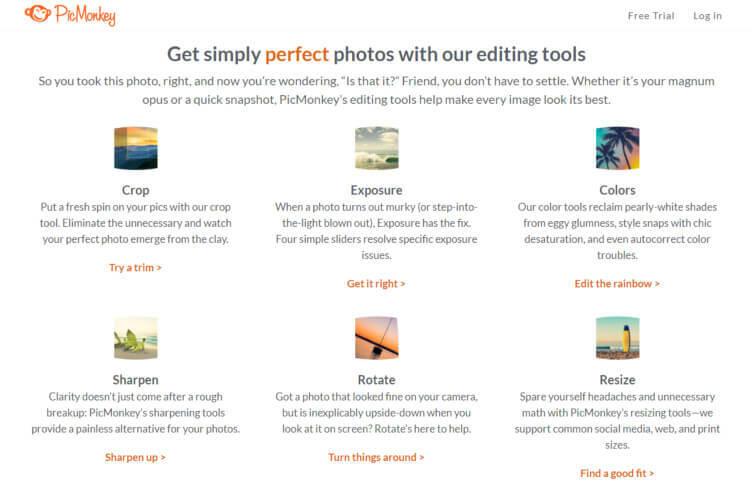 You can take a free 7 day trial on Pic Monkey if you would like to try it out (link below). What is the difference between a paid and a free plan? 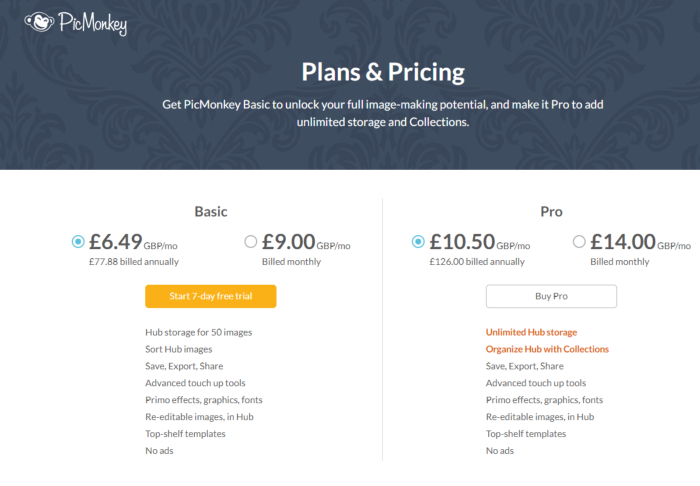 Pic Monkey used to be free to use and you could download various things but more recently, it seems to have changed so that you can use it BUT you cannot save or download your work to your computer or phone until you buy a subscription. This, to me, makes it less approachable than Be Funky for starting out. It is unlikely you would need more than the Basic Plan and as you can see it is a lot more expensive than Be Funky. I would advise taking the free trial and having an explore. If you like it you can then opt to stay on. One of the upsides to Pic Monkey is that the team behind it seem to be innovating quite a lot so new things have rolled out fairly regularly. The website is also very pretty to navigate when you are having a loot around (see image below) so it is quite user friendly. One of the Pic Monkey pages for new users. Be Funky vs Pic Monkey? If I were choosing between Be Funky and Pic Monkey, there is very little in it for a cake maker user. It is a hard choice. But you definitely do not need both as they do similar things. They both work in a similar way and some features are practically indentical. 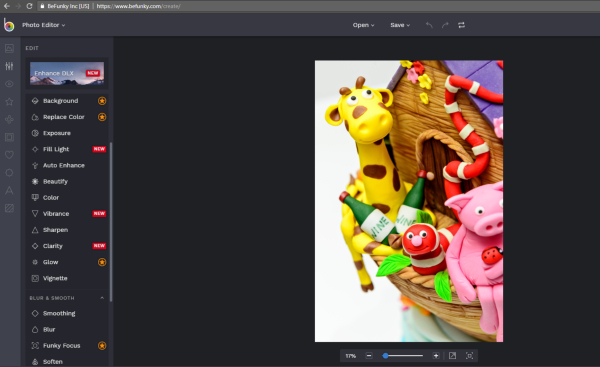 Having said that, in September 2018, Pic Monkey released its latest update and added heaps of new features. It now has a lot of new templates (a bit like you see in Canva). Another cool new feature is the ability to apply different effects to all your layers (ie if you wanna put snow on the picture you can, but you could also add it just to the font, or just to the background). Because of these new features, I may well give Pic Monkey another shot in the near future. Whether you choose Be Funky or Pic Monkey is really it is personally choice - which one works best for you and which do you like best on your gut feeling. If in doubt, you could try them both out (and don't forget that Pic Monkey also has a 7 day trial so you could try it for a week then try Be Funky and choose the one you found easiest). Whichever one you choose, both are a good option. But once you are used to one, you will find it harder to swap as they are so easy to use that they quickly become second nature! How do you buy Pic Monkey? To get the 7 day trial on Pic Monkey, you can buy HERE​. Not sure which to choose and want to have more detailled training on my favourite graphic design tools for cakers? Join the Pretty Witty Academy for in depth, step by step, tutorials on the best toosl for your cake business. The last tool I would choose on the free graphic design tools list is to do with colours. There is a great website called Coolors which will really help you both on your online colour schemes and also in your cake decorating. Colours, colour matching and colour theory can literally make or break your cake career. It is something you need to get your head around but if it doesn't always comes naturally, this tool will help. It enables you to pick a colour and it will find you a string of "matches" including complimentary colours, analygous colours, triadic colours and so on. If you want a quick lesson on what the basic elements of colour theory for cake makes are, then have a read of my post here then pop back to this post (there is also a video on the post about colour theory if you prefer to watch rather than read here. Does it just show hex colours? Hex colours are the codes given to colours online. For example: the blue in this font I am writing in now is called Hex code 118e75. It is often writen as #118e75. In Coolors, not online can you look at the Hex codes of all colours but you can upload an image and then Coolors will automatically generate a harmonised colour scheme by sampling colours in the image. From there you can either accept that one, or make adjustments to it. Wanna see how it works and why it is so good for caker? The best way to show you this fabulous free little tool is to see it in action. Watch this short video on how you can use Coolors both for your graphic work and for designing your cake colour schemes. How do you get colours? The website is for Coolors is here. Head to the section called "Explore" in the top navigation first to play around as described in the video above. If you really want to up your cake game and start looking more professional, you gotta start learning some basic graphic design. The above tools are some of the simplest to use (trust me I have tried a lot) and you will be able to save yourself a ton of money using these (as opposed to paying a graphic designer to do the work for you at 10x the price). And as mentioned above, inside the Pretty Witty Academy, I have in depth tutorials and step by step walk throughs showing you the many possibilities opened to you using Be Funky, Canva and other graphic design tools like those descrived above. If you are serious about making your cake business more profitable, come and try the Pretty Witty Academy today. It is the best online cake and cake business school in the world. Disclaimer: Some blog posts on Pretty Witty Cakes will contain Affiliate links where I can earn a small commission if you later buy from a 3rd party mentioned in my blog.